The federal indictment released today in Washington, D.C., against against ex-Trump campaign manager Paul J. Manafort Jr. alleges among other things he used laundered untaxed money presumably generated by his pro-Russian activities to buy a nice brownstone house in the trendy Carroll Gardens section of Brooklyn, N.Y.
That’s right, folks. 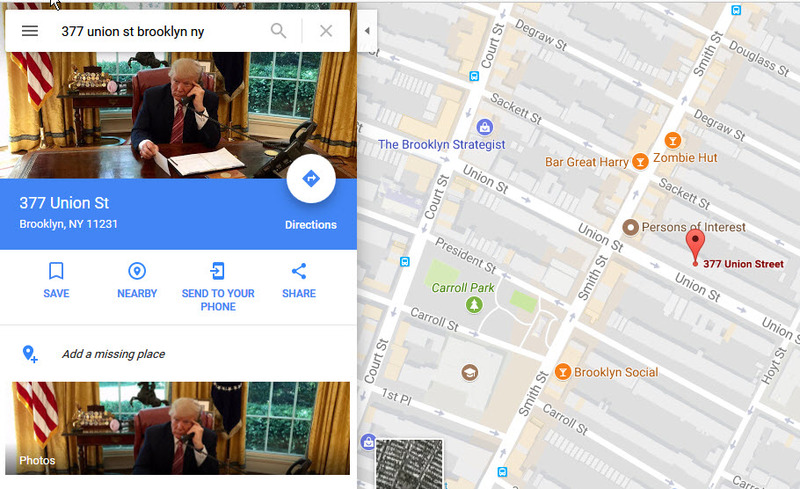 Someone today hacked Google Maps to insert a picture of President Donald J. Trump in the Oval Office in the spot where an image of Manafort’s house normally would appear. If you take a very close look at the map. you’ll see there’s marker for “Persons of Interest” on the same block as the property. I think that is the name of a barber shop. But what a coincidence. While I don’t especially approve of computer hacking, this is tooooooooo funny. The indictment also alleges that Manafort last year obtained a $5 million loan against the Brooklyn property by falsely telling the unidentified lender that much of the money would be used to fix up the property and make it more valuable. According to the indictment, Manafort instead used the money for other purposes. While described in some detail, the dissembling over the purpose of the loan is not directly one of the 12 counts against Manafort. The more serious allegations involve failing to declaring foreign financial accounts, acting as an unregistered agent of a foreign power (the Ukraine, at times a Russian ally) and fibbing about this to the feds. But it is claimed the Brooklyn property was bought with laundered money, and thus subject to forfeiture if Manafort is found guilty. Trump, of course, has no financial interest in Manafort’s Brooklyn house. Which is why you can’t trust everything you see on the Internet and even Google Maps. Still, we’ll see if Trump tweets about this. I agree Bill- waaaaay too funny!!! I really hope this is the start of an unravelling of duplicitous behaviour by these guys. We have our eyes on Anderson Cooper, PBS and anything else American here for the latest news. Thanks for this post. It really is a doozy! !